On the journey to the Nurburgring (the ‘Ring’) we had time to reflect on all that had passed during our hectic stay with Moto Parilla. 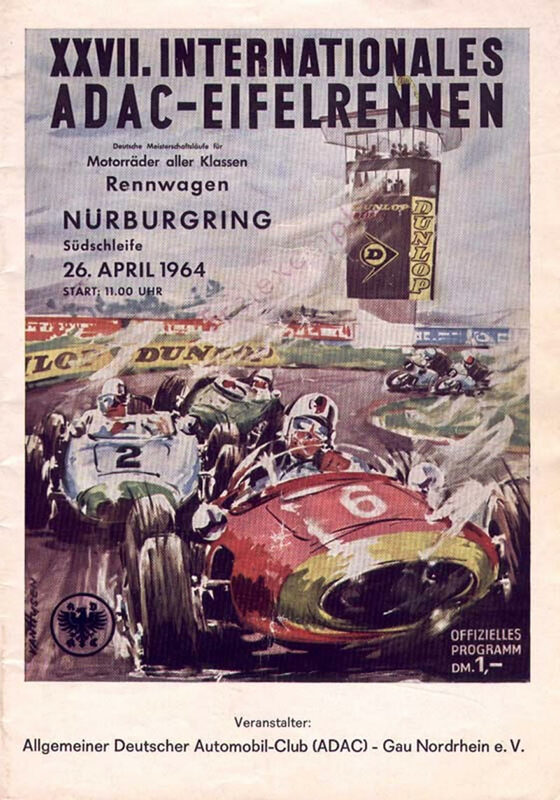 At the time of leaving Milan, we only had entry confirmations for the Saarland GP at St Wendel, Germany, the Budapest ‘Gold Cup’ meeting in Hungary and the ‘Ring’. Our provisional program for the season was to try and enter 18 international meetings including 3 World Championship events. With only £60 now left in the bank, this was clearly going to be an uphill struggle! We were under no illusions as to our ability to achieve any top places in International Races. After all our tuning and lightening, our bikes were still “Grand Sport” models originally intended for production bike class racing; few other manufacturers were still building pushrod engines for road racing in 1964. Aermacchi were one of the few & their engines had a 2 or 3 BHP advantage over most 250cc Parillas. What we hoped we would have going for us over the ever growing hoard of more powerful, but often fickle, 2 strokes of the era was 4 stroke reliability, In short our objectives for 1964 were — to obtain entries, qualify and finish! The journey to the ‘Ring’ took rather longer than planned as a consequence of poor map reading late at night, not a good start! Arriving too late at the ‘Ring’ for the first free practice, we were further alarmed to find the organisers had put me in the 350 and 500cc class races on my 256cc Parilla – the explanation given was that they became over subscribed for the 125 and 250 cc races for which I had originally applied. The blow was softened somewhat for a short period when we were informed I would be paid an extra 50 DM’s (approximately £12) per start, in these races, subject to qualifying! To qualify I had to complete a minimum of 3 practice laps in each class with my best lap time not exceeding 110% of the fastest lap achieved by any competitor in the class! All this on my 256cc Parilla, in my very first ‘Continental Circus’ race! Talk about giving with one hand and taking away with the other! I began to think someone among the organisers had not forgotten the war! We also noticed on our arrival that there were far more competitors in the Paddock for each class than were permitted to start in each race under FIM rules. This meant that in addition to the 110% lap time rule, you had to be in the top 40 or 45 qualifiers to ensure your start! 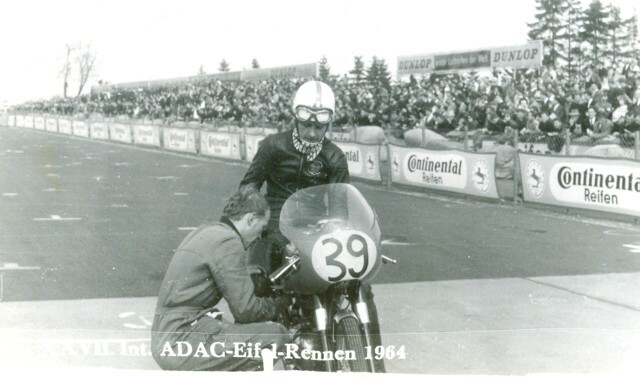 This practice was to be repeated at a number of German International race meetings that year! Having never ridden on a road race circuit longer than 3 miles, my first laps of the ‘Mighty Ring’ came as a huge shock, the circuit seemed to go on for ever and I began to think I would never be able to memorise my way around the track within the time available. The cold and misty weather, typical at the ‘Ring’ in April, did not help. Most of the time I rode ‘middle of the road’ a technique only used when riders do not know where they are going! On returning to the paddock we encountered some mystified race officials who could not understand how an old 250cc NSU had recorded several laps at over 130 mph, a new outright “Ring” lap record. Vic and I knew how! He was the “official” number 10 & I was circulating about half a lap behind him. Two 10s passing the timing clerks per lap produced the lightning quick “laps”. With another 2 practice sessions and with some further improvement, I just qualified for both the 350 and 500cc races then ,exhausted, slept for the next 10 hours. With my lack of experience of the ‘Ring’ I could not attack the circuit as I would a Park or Airfield circuit. With 45 riders on the line, I had reasonable starts in both races and by pulling a high top gear, was able to get some useful tows during the early laps on the long straights which made up a little for my lack of aggression in the bends. With 18th and 20th place finishes in the 350 and 500cc races respectively, I was more than happy with my days work as we left the ‘Ring’ and set out for St Wendel, with the extra start money also in our pocket. The 350 race was won by Heiner Butz (Norton) followed in by Karl Hoppe (AJS) and Gyula Marsovszky (Norton). Gyula Marsovszky (G50 Matchless) won the 500 race ahead of Jack Ahearn and Vernon Cottle – both on Manx Nortons. On reflection I came to understand why many of the ‘Continental Circus’ riders would not ride the ‘Ring’ unless they were under a Works contract to do so. Those that did ride usually only did it once as the ‘Ring’ had a reputation for taking a heavy toll on engines, gearboxes and other components, sometimes difficult and always expensive to replace. Most of the foreign riders would in any case only get one opportunity to ride the ‘Ring’ each year, this was not nearly enough for them to be able to demonstrate their usual riding abilities or to do the ‘Ring’ justice. The circuit was no longer used for International motorcycle racing after 1966. I recently read an article describing the experience of a Yamaha R1 owner who visited the circuit and wisely hired a Ring Master to lead him around for 3 laps of the track. At the end of the session the Ring Master asked him what he thought of the experience, the reply was simply “awesome”. I cannot but agree with him and have no regrets for racing on ‘the mighty Ring.’ I wish, however, I had been able to hire a Ring Master in 1964!